Most mail servers can’t handle files totaling more than 25 MB. That’s enough for a song or two, a handful of digital photos, and most documents. That’s usually not enough to send videos, though. If you send a file you’ve created in Microsoft Word and the recipients don’t have Microsoft Word, they won’t be able to open or edit your Word file. To avoid confusion, let the recipient know what program you used to create your file. To conserve your tablet’s precious storage space, the Mail app doesn’t automatically download attached files and save them to your tablet. Instead, the Mail app shows attached files using a faintly colored icon. Tap the word Download next to the attached file. Tap Download, and the Mail app downloads the file to your tablet. Once the Mail app finishes downloading the file, its icon regains its normal coloring. If you just want to view the attached file (or play an attached song), tap the file’s icon and choose Open from the drop-down menu. If your tablet has an app or program capable of opening the file, that program opens the file, letting you see or listen to the attachment. Once you’ve seen or heard the file, you may be done, and ready for different adventures. But if you want to edit the file, or access it later, extract the file from your e-mail and save it in a more permanent location by moving to Step 2. Tap the attached file’s icon and tap Save from the drop-down menu. Windows’s File Picker appears. The File Picker serves as the Start screen’s equivalent of the desktop’s File Explorer: It lets you shuttle files from one location to another. Choose a folder to receive the saved file. Tap the word Files in the File Picker’s top-left corner and then choose which library to receive the incoming file: Documents, Pictures, Music, or Videos. Windows constantly indexes the contents of your four libraries: Documents, Pictures, Music, and Video. Saving your file in one of those libraries makes it easier to find it again later by using the Charms bar’s Search icon, and searching the Files area. Don’t know where to put it? Choose the Documents library, which serves as a catchall for anything that’s not a photo, song, or movie. Tap the Save button in the File Picker’s bottom-right corner. Once you’ve chosen the file’s destination, the File Picker places a copy of the e-mailed file in that location. Repeat these steps to save any other attached files. Unfortunately, the Mail app doesn’t allow you to select multiple files and save them in the same place. So, you must repeat these steps for every attached file you want to save. Even after you save a file to a folder, it remains in your e-mail. If you somehow lose your saved file, head back to the original e-mail and repeat these steps to save a fresh copy. You can download attached files only when connected to the Internet. That’s why it’s important to save files you may need to access in areas without WiFi coverage. To avoid hogging space on your tablet, many e-mail accounts display only your last two weeks worth of messages in the Mail app. After two weeks, those files will scroll off your tablet’s Mail app. If you need an attachment you received three weeks ago, it’s not lost forever, even if it’s scrolled off the Mail app. Visit your e-mail’s website. From the website, you can find all your e-mails, no matter how old they are. Sending a file through the Mail app works just the opposite of saving an attached file. Instead of finding a file in an e-mail and saving it into a folder or library, you’re finding a file in a folder or library and saving it in an e-mail. Open the Mail app and create a new e-mail. Choose the recipient, and write your message. Open the Mail app’s App bar and tap the Attachments icon. 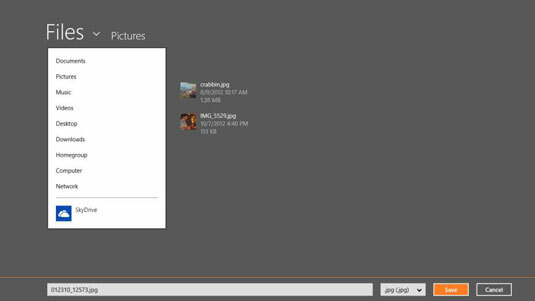 Tap the Attachment icon from the App bar, and the Windows 8 File Picker window appears. Navigate to the file you want to send. Tap the word Files to see a drop-down menu listing your computer’s major storage areas. Most files live in your Documents, Pictures, Music, and Videos libraries. Tap any folder’s name to see a list of the files stored inside. Don’t see the files you want? Tap the File Picker’s Go Up link to retreat from that folder and try again with a different folder. Tap the name of each file you want to send; then tap the Attach button. A tap selects a file; tap a file again to deselect it. As you tap files, their color changes to show they’re selected. A tap of the Attach button returns to the Mail app and attaches the file or files to your e-mail. In the Mail app, tap the Send button. The Mail app sends your mail and its attached file or files to the recipient. Depending on the size of your attached files, this may take from several seconds to several minutes. Because it all takes place in the background, feel free to switch to another app, browse the web, or grab another bagel at your free WiFi spot. When your recipient receives your attached files, he can save them onto his own computer, no matter what type of computer or e-mail program he owns. If you try to attach too many large files, the Mail app warns you with a message across the mail’s top: The Attachments Might Be Too Large to Send This Message. Try Selecting Send Using SkyDrive Instead. If you spot that message, tap Send Using SkyDrive Instead. The Mail app then uploads those files to a new folder on your SkyDrive account and sends the recipient a link to that folder where he can view or download them.